The Hartsfield-Jackson Atlanta International Airport is the busiest airport in the world. While not the largest in size, the sheer number of passengers it handles on a daily basics makes it the busiest. This is mainly because it’s the hub for Delta. But the location is also key for domestic and international travel. We are frequently at the Atlanta Airport for the simple reason that Delta is one of our preferred airlines. Flights to the Caribbean, Europe, and Belize are easy and there are always options. BUT, it is busy, crowded, always under construction, and when you travel like we do, perfect in many ways and not so perfect in others. That said, considering they move nearly 90 million passengers a year, I think they do a great job. While a big airport, it is manageable. It is easy to get around and we have no issues making tight connections. When we fly to Belize City, we have 43 minutes to connect. We literally get off our flight (granted we are first off since we fly first, so that helps). Then, depending on if we can catch a Plane Train, either start to walk to the next terminal (we usually fly into B ) or jump on the train, get over the E or F, and walk onto the flight. As usual, we always suggest that you have club access through Delta or your American Express Platinum Card. The Clubs are limited to Delta, of which there are nine, United, American, and The Club at ATL. We prefer the Delta Sky Clubs, but will use The Club at ALT sometimes, too. All of the Delta Sky Lounges are nice, but here are some tricks. First…If you are expecting a delayed or cancelled flight or think you may be stuck overnight because they are shutting down the city (which happens at a snow flake), get yourself to the Delta Club in Concourse B. When the airport shuts down, the city does, too, so you will not be able to get to a hotel. Run, do not walk to this flagship lounge. It is the one they staff for 24 hours. But the line will get long and they will stop letting people in. This “traveler’s retreat” is a savior if you can get a room. Located in Concourse B, we hear a second is on the books. You should always look to pre-book on line. Only once in all my delays was I able to book a few hours before in a suite. It was well worth it. Given that there are no airport hotels, having a private room for a few hours is wonderful. They have a daybed sofa, pillows, blankets, and a TV. They are great for layovers or delayed/cancelled flights. While not always the way to go, the plane train people mover connects you to all the concourses. But when we have time, we love to walk. The moving sidewalks and beautiful art and interesting history exhibits are delightful to enjoy while moving between flights. Our favorite is the virtual walk through a forest called Flight Paths complete with sounds. It is located between Concourses A and B and is worth a visit even if you are not flying out of that area. Just don’t get too distracted that you miss your flight! Rainforest walking wonderland called Flight Paths. Photo credit Atlanta International Airport. Take advantage of the amenities offered. The airport has three interfaith chapels and a yoga room for your spiritual and relaxation needs. There are services throughout the week in the chapel and the yoga room is open to all. Both are great retreats from the hustle and bustle of the airport. There are a few XPresSpas in the Atlanta airport. We love these for a quick chair massage, manicure, and even a facial. Whether you plan on stopping in because you have time or your flight was delayed and now have extra time – do it! We have yet to have anything but a fabulous experience. The Hartsfield-Jackson airport has an elaborate collection of art. With both permanent and rotating exhibits, it is a feast for the eyes. We love them all, but the massive hanging sculptures in the International Terminal and in Concourse F should not be missed. Hanging art at Atlanta Airport International Terminal. The Atlanta Airport has 10 permanent exhibits and many rotating exhibits, so there is always something great to see. The Delta Sky Clubs also have a feast for the eyes with rotating art. We have even contacted two artists from pieces we found in Delta Sky Clubs. Watch this brief movie on a current exhibit on Zimbabwe to see for yourselves! While there are no airport hotels, there are three hotels that you can reach via the Sky Tram. There’s the Marriott Atlanta Gateway, the Springhill Suites, and the Renaissance Atlanta Airport Gateway. They also offer complimentary shuttle service. Baggage claim is one of the reasons we do not like the Atlanta Airport. Why baggage claim you ask? Well, no matter what Concourse you land at, you have to trek all the way to the last stop on the plane train to pick up your luggage. UGH! Our secret...Get in the first car of the plane train to be in front of the crowd. Baggage claim is so far away from Concourse A that our bags are actually waiting for us when we arrive. Once you arrive in Atlanta and if it is you final destination you will most likely at some point need the Sky Tram. Atlanta has one of our least favorite things, off-property rental car pick up. It is its own huge facility off-site that you have to board the Sky Tram to get to. Our secret…We only use priority pick up with our rental car company, so we do not have to wait in lines. If you don’t belong to any car rental company rewards program, pick the one(s) you use a lot and join. It seems they are always under major construction, which is what you get for being so big I guess and having to maintain your infrastructure. Some areas and gates are very dark and do not have natural light. Finally, the people. There are just SO many people! 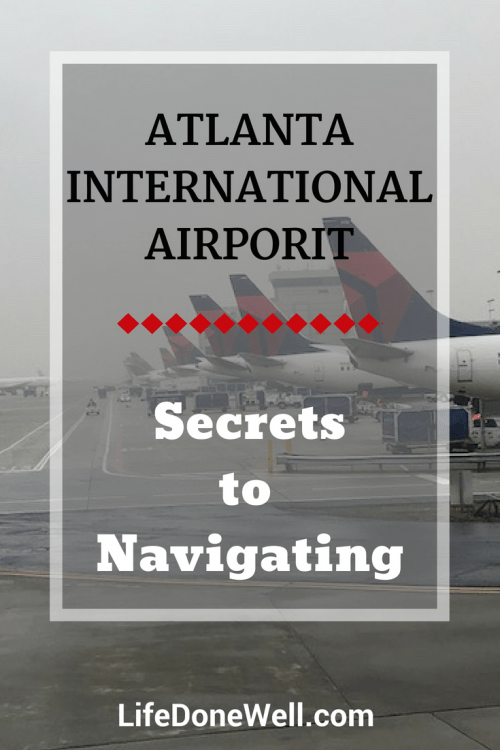 Do you have your secrets to navigating Atlanta Airport? 1. Park at Peachy Parking if you life in the city. At car pickup and service every 10min to domestic and 20min to international. Dramatically improved my airport experience. 2. Get Clear and Mobile passport for WAY faster domestic outgoing and international incoming security, respectively. Thank you so much! These are great tips! Now I must go track down said pudding tomorrow- I LOVE pudding!